In this section, several ideas are presented related to the access, requirements, management and production of four resources fundamental to any human space mission: energy, air, water and food. Utilising local resources to manufacture methalox bipropellant is discussed separately (see In Situ Propellant Production). Space missions are effectively isolated from the environment of Earth where resources are comparatively much more accessible, and hence largely taken for granted. Resource management in space missions is paramount in order to ensure that sufficient quantities are available for the entire mission. In addition, the high cost of launching mass from Earth to space dictates that quantities of consumables to be brought from Earth are minimised. Rationing rules must be followed by the crew in order to control consumption of life support resources within certain limits. Rationing applies primarily to food and water, and simply means that a per-sol ration of each is allocated for each function (eating, drinking, washing, etc.). Crew members are required to strictly consume an amount equal to or less than their allocated ration, during each sol of the mission. In this way, a limited quantity of food and water can be made to last for the full duration of the mission. Naturally, a buffer is built into the supplies to allow some flexibility when required and for contingencies. Other rules can be implemented to conserve energy consumption. For example, use of computing and communications equipment could be restricted to daylight hours when power can be drawn directly from solar panels instead of from less efficient sources such as batteries or fuel cells. This applies primarily to water and air, and is the most effective strategy for reducing consumable requirements. Almost all water consumed by the crew can be recovered from blackwater, greywater, and the habitat atmosphere. On the ISS water is recycled with an efficiency of 90% or greater, significantly reducing the amount required for each mission. The efficiency with which air can be recycled depends largely on how CO2 is handled. In space it may be purged, or the O2 component can be recovered using biological methods such as plants, or physicochemical methods such as LiOH (lithium hydroxide) canisters or SOECs (Solid Oxide Electrolysis Cell). On Mars, CO2 from the SHAB atmosphere may also be purged, or it could be captured and recycled back into the ISAP (In Situ Air Production) system, especially if O2 is being made from CO2. ISRU refers to making use of resources from the Martian or space environment rather than transporting them from Earth. Examples of useful resources that could be obtained this way during early missions include water, hydrogen, oxygen, nitrogen, methane and methanol. Even the use of solar energy could be considered ISRU. As settlement progresses ISRU techniques will be used to produce bricks, glass, plastics, metals and everything else, as on Earth. This approach is commonly referred to as “travel light; live off the land”. Like the explorers who once trekked across the continents of Earth, those who were most successful typically only carried with them some of the resources they needed, obtaining the remainder from the natural environment. The primary benefit of ISRU is a reduction in the amount of material that needs to be launched from Earth, which translates to reduced mission cost. The trade-off is the development of the equipment needed to obtain the resources, which must be carried instead. Blue Dragon proposes producing methalox bipropellant, potable water and breathable air from the local Martian environment. Previous proposals for HMM architectures have been more conservative in terms of inclusion of ISRU, either excluding it altogether, or including only a moderate level. This seems rational, because provision and management of resources is critical for success of the mission, and ISRU has not yet been demonstrated “in the field”, so to speak. However, because ISRU provides such a benefit in terms of reduction in launch mass and improved safety, it’s worth mastering and incorporating as much as possible. Although ISRU is yet to be demonstrated at Mars, this problem can be addressed by sending one or more robotic missions to do just that. A concept mission called “Green Dragon”, which is a Red Dragon capsule containing an integrated ISRU system that produces air and water as if for a habitat, would be a reasonably inexpensive method to achieve this. Another mission called “Gold Dragon” would test the operation of the MAV, including solar energy utilisation, water extraction and propellant production (see Precursor Missions). Although the cost of the Green and Gold Dragon missions is nontrivial, the benefits and ROI will be substantial, as demonstration of, and experience with, production of energy, water, air and propellant from locally obtained resources will be invaluable for future human missions and settlement. What if the recycling equipment malfunctions and cannot be repaired? What happens if the crew miss the return launch window for some reason and must stay on Mars for a further 26 months until they can attempt another launch? If the crew have the necessary equipment to make potable water from the local environment, the crew will be in a much safer position; at least in terms of water. Naturally, there are also risks associated with reliance on ISRU, such as, what if it doesn’t work, or what if the equipment breaks down? The difference is that ISRU technology must be developed sooner or later anyway. Once developed, tested and refined, ISRU technology will ultimately produce a far more secure situation for the crew, and is essential for ongoing settlement. ISRU of air, water, food and methalox will be discussed. One of the primary challenges associated with any Mars mission is the design of power systems. The primary energy sources under consideration for HMMs are nuclear fission and solar. Nuclear fission energy has a clear benefit that accounts for its popularity in Mars mission designs: it can provide abundant, continuous power irrespective of weather or location. A fission reactor could provide ample power for ISRU processes, ECLSS and other electrical subsystems, and because nuclear reactors can provide power continuously, they do not require an associated energy storage solution. For this reason, many in the space community assume that HMMs should rely on energy from fission. In Mars Direct, the ERV includes a nuclear reactor to provide energy to the ISPP system, which enables propellant production to occur rapidly. Once the ERV lands on Mars, a small robotic truck emerges with the nuclear reactor. The truck carries the reactor some way off, trailing electrical cable connecting it to the MAV, and places it in a nearby depression in order to prevent radiation products from irradiating the MAV, crew, or any other part of the base. This would ideally be a natural depression; or, one could be created using explosives. The reactor must be distanced from the MAV and surrounded by rock in this way because it will be unshielded. Why is the reactor unshielded? On Earth, nuclear reactors are heavily shielded to absorb radiation, in addition to being encased in multiple containment shells in case of an accident. However, due to the high mass of these elements, it may not be practical to include them with reactors to be sent to Mars. To do so would make it even harder to land an ERV or MAV on Mars. If the reactor is unshielded, even if moved some distance away from the MAV, it would create a no-go zone around it that would be unsafe for the crew to enter. The MAV may be protected from radiation, but the environment surrounding the reactor would not be. Irradiating the environment would interfere with scientific research by hampering exploration, polluting data, and possibly harming extant life. Mars should be treated more responsibly than this. What if the reactor is parked near something of scientific interest? What if it needs attention for some reason? What is the long-term plan for decommissioning the reactor? A common argument against space exploration is: “We messed up one planet already, should we mess up another?” If these kinds of environmentally irresponsible practices are permitted, then such criticism is justified. Earth’s environmental problems are the result of greed, short-term thinking, and wishfully assuming that the planet is big enough to absorb industrial pollution without considering if that policy will scale with population. Is the intention really to export the same dysfunctional thinking to Mars? We should have learned this lesson by now. Our long-term goal must always be kept top of mind, which is to settle Mars and transform it into a beautiful new home for life. The primary benefit of the frontier is to invent better ways of living in harmony with each other and the environment, and the intention should be to bring the best of humanity to Mars and leave the worst behind. It’s simply unacceptable to commence habitation of Mars with serious pollution. That kind of short-term thinking has well-proven negative effects. This opinion does not mean fission should be completely ruled out as a power source. There are several new types of reactor currently in development that do not have many of the problems associated with the existing generation of reactors. Also, shielding mass could perhaps be significantly reduced by using new materials and manufacturing technologies, and, combined with the reduction in cost of access to space, future space nuclear reactors may be effectively shielded. However, there is another significant problem associated with fission reactors on Mars: in the event of an accident, malfunction, or even routine maintenance, all of which are more likely in the unfamiliar and challenging environment of Mars, access to the reactor would be considerably more difficult, and there may not even be people around to do the work. A nuclear accident on Mars combined with a global dust storm could effectively distribute radiation products over the whole planet. Regardless of how unlikely an event may be, if there is a better option for energy production then it really must be taken. Mars already has a difficult enough radiation environment without making it worse. The IMRS plan includes nuclear energy sources in the form of ASRGs (Advanced Stirling Radioisotope Generator) powered by Pu-238; however, this energy is produced by radioactive decay, not fission. This type of nuclear power source is already present on Mars, as Curiosity is also plutonium-powered, as were Viking 1 and 2, and as the Mars 2020 rover will be. This form of nuclear power is significantly less dangerous than fission. In any case, strict safety protocols for managing radioactive materials of all kinds will need to be established for Mars. Solar has been proven as a practical and reliable energy source on Mars. Along with many other Mars and space missions, the MERs Spirit and Opportunity were powered by solar energy. Spirit was active for 6 years, and Opportunity is still going after almost 10 years at the time of writing. Research has shown that modern solar technology can match the mass and volume performance of nuclear energy on Mars (Cooper et al. 2010), and because of safety, environmental and policy issues, is likely to be preferred. The main problem with solar panels is that they represent a fluctuating energy source that varies with diurnal and seasonal cycles, weather, and atmospheric dust levels. Dust can accumulate on panels, reducing their effectiveness, although with a human crew present this problem can be addressed with conventional push broom technology. Solar energy at the surface of Mars is about half that of Earth. The solar intensity at the upper atmosphere is 43% compared with Earth, but this ratio is improved by the fact that Mars has a thin atmosphere and few clouds. Solar energy is currently one of the largest areas of investment on Earth, and the technology is advancing rapidly. In 2011 investment in solar peaked at about $157 billion. Investment in rooftop solar peaked in 2012 at about $80 billion. Solar is now a mainstream energy technology on Earth and will clearly become more so over the coming decades. Solar energy technology is suitable for Mars missions, with numerous advantages over nuclear. The MAV and SHAB can carry rolls of flexible CIGS solar material that can be robotically unrolled onto the surface of Mars to collect solar energy in an efficient and simple manner, and with much less risk and difficulty than deploying a nuclear reactor. Battery technology is evolving rapidly due to the proliferation of mobile devices and electric vehicles. The development of graphene Li-ion anodes has produced batteries that charge significantly faster and can store more energy. Batteries tend to be heavy, but the amount of energy stored per unit mass, and per unit volume, is increasing. Batteries require minimal maintenance and are highly reliable. Fuel cells are comparatively more complex and can break more easily. Fuel cells require a supply of O2 for combustion, which, on Mars, costs energy to produce. One benefit of a fuel cell is that it can potentially last much longer, whereas batteries can only be recharged a certain number of times. Despite the benefits of batteries, inclusion of a CO fuel cell in the SHAB may be a worthwhile inclusion given that its ISAP system produces CO (see In Situ Air Production). This could be utilised as a nighttime energy source, assuming sufficient O2 supplies. Graphene supercapacitors are a technology currently in development, which will probably be available well before 2030, and may be far superior to batteries. They can store much more charge per unit volume or mass, recharge extremely quickly, and, unlike batteries, there’s no limit on how many times they can discharge and be recharged. This technology is therefore receiving considerable interest due to its potential for use in electric cars, electronic consumer devices and other applications. Another significant advantage of graphene supercapacitors is that they’re made of pure carbon, which means they could be manufactured from Martian air. With these things in mind, the intention for the IMRS is to utilise graphene supercapacitors or graphene-anode batteries for energy storage, in addition to one or more CO fuel cells for nighttime power. Other energy resources available on Mars will become more important as settlement proceeds and technological infrastructure develops. The primary difference between the energy infrastructures on Mars and Earth will be that fossil fuels of any type, on which humanity has been so reliant, are probably unavailable on Mars. In addition, energy sources related to water, such as tidal, wave and hydroelectric energy, will be unavailable until terraforming is well advanced. The air pressure on Mars is very low (less than 1% of Earth’s), which means it doesn’t generate sufficient force to produce much electricity. Comparatively, solar energy offers a better return in terms of energy produced per unit mass of hardware sent to Mars. Wind turbines operating in such a dusty environment may require high levels of maintenance that could be difficult or dangerous for settlers to provide. Early Mars missions will probably be located in low altitude areas, for warmth and water. The air may be thicker, but the wind will be slower. Wind turbines on Mars may perform better at high altitudes. Like solar and other renewables, wind energy technology is advancing at an exponential rate. New turbine designs, new materials and additive manufacturing should produce very lightweight, low-maintenance and low-friction turbines in the near future, and designs suitable for Mars are inevitable. The low gravity may permit the construction of very large turbines capable of powering settlements. One advantage of wind energy is that turbines are simpler than solar cells and fabricated from less exotic materials; therefore, the capability to manufacture turbines from local Martian resources may be developed sooner than for solar cells. Due to the relative ease of manufacture, settlements could access wind energy more effectively than solar simply by producing and deploying turbines in quantity. Areothermal energy may be available on Mars in regions of recent areological activity. If the IMRS is expanded into a larger-scale settlement, a nearby source of areothermal energy will be a huge advantage, potentially far more valuable than any other energy source currently under consideration. Areothermal energy is both scientifically interesting and of immeasurable value to future settlements, capable of providing baseline power without the environmental issues associated with fission, or the need for energy storage subsystems as with solar and wind. Sources of areothermal energy may ultimately become the preferred locations for settlements on Mars. Areothermal hotspots offer more than simply the potential for electricity generation. They could provide direct heating for settlements in addition to being associated with aquifers — valuable sources of liquid water. Although postulated, the presence of areothermal energy is yet to be confirmed, and deep drilling equipment and/or sub-surface radar may be necessary to achieve this. In any case, it will be inaccessible to early explorers and settlers. If developed into a mainstream energy technology, nuclear fusion may become important on Mars due to the relative abundance of deuterium (an isotope of hydrogen with both a neutron and a proton in the nucleus, also known as “heavy hydrogen”; ordinary hydrogen only has a proton). In terms of atoms per litre of water, deuterium, a practical fusion fuel, is five times more abundant on Mars than on Earth, and 10,000 times more abundant than on the Moon (Zubrin 1996). It’s important to note, however, that in terms of absolute quantities Earth has around 50 times as much deuterium as Mars simply because Earth has around 250 times as much water, plus deuterium on Earth is much easier to access since most of the water is in a liquid state. Therefore, deuterium will probably never be exported from Mars to Earth, although it may be an important resource to settlers on Mars and elsewhere. The second reactant in this equation, helium-3 (3He), is far more abundant on the Moon than either Earth or Mars. If fusion ever becomes a major energy source, deuterium resources on Earth and Mars combined with lunar helium-3 could be valuable synergistic commodities in the triplanetary economy. One of the major energy requirements during the mission will be maintaining a comfortable temperature inside the habitats. For optimal human comfort and productivity the desired temperature inside the habitats will be in the range of about 295-298 K (22-25 °C, or 72-77 °F). The large amount of electrical power consumed by the station’s systems and experiments is turned almost entirely into heat. The heat which can be dissipated through the walls of the station’s modules is insufficient to keep the internal ambient temperature within comfortable, workable limits. Ammonia is continuously pumped through pipework throughout the station to collect heat, and then into external radiators exposed to the cold of space, and back into the station. Appropriate solutions for thermal management may already be built into the B330. If not, solutions could be adapted from those developed for the ISS. The thermal environment of interplanetary space is similar to that in LEO, although it will become cooler farther from the Sun. Although the priority in the THAB will be cooling, due to the low temperatures on the Martian surface the primary energy requirement for the SHAB may be heating. The surface temperature on Mars varies between 130 K and 308 K, with an average of about 218 K, which is about the same as the interior of Antarctica. The SHAB will therefore need to maintain an internal temperature approximately 80 K warmer than the external environment, on average. This is a significant temperature gradient, and one that must be maintained constantly. As in the THAB, the operation of electrical and electronic equipment in the SHAB will produce plenty of heat, which will help to reduce the amount of energy required for heating. Also, the shell of the B330 provides significant thermal insulation. This could be augmented with regolith piled around the SHAB, which would also provide additional protection from radiation. When external temperatures are higher, the interior of the SHAB may, like the THAB, require cooling. The thermal control subsystem must therefore be capable of controlling temperature in both directions. Good design can produce both passive cooling and heating effects. Further analysis is required to determine the actual energy requirements for thermal control in the habitats. Although an uninterrupted power supply is not required for the MAV, it is a requirement for the SHAB because the ECLSS must operate continuously. As discussed, the SHAB will be powered by solar energy, which means an energy storage solution is necessary. Some percentage of the solar energy collected each sol will be stored for use during the night. However, due to efficiency losses in energy storage, as well as limits on how much energy can be stored with the available equipment, it’s important to minimise the amount of energy to be provided from storage. Energy required by the SHAB during the Martian night, when no solar power is available and the SHAB is reliant on stored energy, can be reduced significantly if a simple rule is implemented specifying that the crew sleeps or at least rests while it’s dark, i.e. wake at dawn each sol and do all work in daylight hours. With this regulation in place, power for lighting, computing, communications, laboratory experiments, etc. will mainly be required during the daytime when solar power is directly available. The SHAB subsystem requiring the most power during the night will be the ECLSS, partly because other electrical loads will be minimised, but mainly because energy requirements for heating will be higher than during the day. Communications will also require constant power. Even when the crew is not using the communications channels, telemetry data will be streaming back to Earth continuously. The B330 has two arrays of solar panels, which will be deployed on arrival of the SHAB at Mars in order to power the ISAP, cameras, antennas, environmental sensors and other systems. For additional power, as mentioned, rolls of PV material could be unrolled on the surface. Breathable air is required in the THAB, SHAB, CAMPER, capsules and marssuits. The crew will always be wearing their marssuits inside the Dragon capsules, although they should only need to breathe from the suits during ascent from Mars. THAB: The B330 will be inflated and pressurised with breathable air very similar to the Earthian atmosphere. Its built-in ECLSS will maintain the air quality during the outbound and return missions, in much the same way as the ISS: scrubbing excess H2O, CO2, CH4, NH3 and other contaminants from the habitat atmosphere, and topping up with O2 and N2 as required to maintain the correct partial pressures. SHAB: As discussed below, the SHAB atmosphere will have a pressure of around 53 kPa. Compared with Earth, this is slightly greater than half the atmospheric pressure at sea level, or the same as at about 5.5 km altitude. The SHAB will include a compact and lightweight ISAP system to manufacture breathable air from the local Martian environment, which is necessary for maintaining the desired operating pressure within the SHAB, compensating for losses due to airlock cycling and other causes, and as a source of O2 for marssuits. CAMPER: The CAMPER’s atmosphere will match the SHAB’s. It will include a compact, lightweight ECLSS similar to that found in a Dragon V2, and may be able to top up or freshen its air supply by connecting with the SHAB. Marssuits: Marssuits will provide astronauts with pure O2 to breathe, and will scrub exhaled CO2 with something like LiOH canisters. The suits’ O2 tanks will be refillable from the ISAP system, with refill ports available on both the interior and exterior of the SHAB. Einstein: This capsule will initially contain normal Earthian air. This will mix with Adeona’s atmosphere, which has virtually the same composition, after docking. When the crew use this capsule for Mars descent, it will initially contain air from Adeona. When they arrive at Mars surface and pop the hatch, that air will escape and the capsule will fill with Martian atmosphere. However, the crew will be breathing pure O2 from their suits, having already prebreathed aboard the MTV prior to descent. Kepler: When the crew enters Kepler it will contain Martian atmosphere, but the crew will again be wearing their marssuits and breathing pure O2. Upon docking with Adeona, its atmosphere will mix with air from inside the THAB before the crew transfer into Adeona. Newton: As this capsule is launched from Earth, it will initially contain normal Earthian air. When it docks with Adeona, this air will mix with the spacecraft atmosphere, which has virtually the same composition. The crew will then enter the capsule and descend to Earth surface. Purging of waste gases (e.g. CO2). Leaks. Although designed for zero leaks, in practice some small leaks are possible. Airlock cycling (for the SHAB and CAMPER). Refilling of marssuit and CAMPER tanks from the SHAB’s supply. Pressure loss will be managed in the same way as on the ISS. Oxygen and buffer gas are kept in separate tanks so that both the partial pressure of each can be precisely controlled. If the partial pressure of either falls below a given threshold, then the atmosphere is replenished from the respective tank. As explained below, the buffer gas in the SHAB will not be pure N2 but a mixture of N2 and Ar in approximately equal proportions. Because warm air does not rise in microgravity, ventilation and circulation will be important in the THAB, as in the ISS. Air around laptop computers, for example, can heat up considerably. Consistent air flow through the ISS is maintained via the use of fans. Within the SHAB, even though it will be operating in a gravity environment, ventilation will still be important. Any volume can produce hot and cold spots if air circulation is inadequate. Effective circulation is also important to ensure that accumulated CO2, NH3 and other contaminants in the habitat atmosphere are effectively scrubbed by the ECLSS. The atmosphere inside the THAB will be very similar to normal Earthian conditions, with one atmosphere (101.3 kPa) pressure comprised of 21% O2, about 78% N2, plus small amounts of CO2 and H2O. This matches the ISS, Shuttle, Vostok, Mir and other space stations and spacecraft. Discounting hypogravity effects (such as hot air not rising), the behaviour of the atmosphere is predictable in terms of its interactions with organisms and equipment. It reduces the cost of equipment inside the spacecraft. Rather than needing to design equipment for a specialised atmosphere, as was necessary with Apollo, Skylab and many other early spacecraft, with an Earth-normal atmosphere many ordinary COTS items developed for Earth can be used in the spacecraft without alteration. No adaptation is required for astronauts when moving between the spacecraft and Earth. Physiological effects of long-term exposure to a reduced pressure or low-oxygen atmosphere are not a consideration. No time or energy is required to pressurise or depressurise capsules for crew transport to or from Earth. A high percentage of buffer gas greatly reduces fire risk. The B330 is designed for an Earth-normal atmosphere, since one of its proposed applications is space tourism. The advantages of a normal Earthian atmosphere apply equally well to the SHAB as they do to the THAB. However, a good case can be made in favour of a reduced atmospheric pressure for the SHAB. If a custom SHAB was being built, one reason would be the potential for reduction in its mass. The higher the internal atmospheric pressure of the SHAB, the stronger and heavier it needs to be in order to contain that pressure. However, the mass of the SHAB should be minimised as much as possible due to the difficulty of landing such a heavy object on Mars. In this plan it doesn’t matter, because by using a COTS item instead of a custom-built habitat, the SHAB’s mass will be the same regardless of internal air pressure. A far more compelling reason for a reduced atmospheric pressure in the SHAB is the potential for a ZPB (Zero PreBreathe) protocol for EVAs. Spacesuits typically use pure O2 as breathing gas, which simplifies the PLSS (Personal Life Support System) and thereby reduces the suit mass. Minimising suit mass is crucial if astronauts are to healthfully conduct many extended EVAs, as they will wish to do so while on Mars; hence early marssuits will probably also only provide O2. Spacesuit pressures have historically ranged from 26 kPa to 57 kPa. Spacesuits providing higher pressure are sometimes referred to as “Zero Prebreathe Spacesuits” (ZPS), as they permit an astronaut to transition to the suit without needing to spend any time prebreathing. Prebreathing involves breathing pure O2 for a period of time, from 30 minutes to several hours, at atmospheric or mid-level pressures in order to purge N2 from the blood and other tissues. This is necessary with low-pressure suits to prevent DCS (decompression sickness, also known as “the bends”). ZPSes for Mars are highly desirable, as they will result in considerable saved time and much greater convenience for the crew, who will wish to go outside as often as possible. It’s far easier to achieve a ZPB protocol with MCP suits, as these can support a higher pressure while maintaining good mobility. Gas-pressurised suits, on the other hand, require very low air pressure in order to facilitate effective mobility. An R value of more than 1.0 may have a risk of decompression sickness. This risk increases with increased R value. The risk of decompression sickness during a mission is statistically cumulative over a number of decompressions during that mission; therefore, the mission duration and frequency of EVA must be considered when determining an appropriate value for R for a given mission. A statistical analysis of cumulative risk shows that for R=1.22, the risk of decompression sickness after 10 decompressions is 7%, while for R=1.4 the risk is 37%. Therefore, cumulative risk is an important criterion for long-term planet surface missions and it increases rapidly as R is increased above 1.0. If the decompressions are not separated by enough time to eliminate previously formed gas bubble nuclei from body tissues, the risk of decompression sickness on subsequent decompressions is also greatly increased. Fortunately, it is possible to design an atmosphere for the SHAB that will permit an R value of 1.0 in order to support a ZPB protocol without risk of DCS, which will benefit the astronauts’ health while saving considerable time. This is a very strong reason in favour of a non-standard atmosphere in the SHAB. Atmospheres in early spacecraft had low total pressure, low oxygen pressure, or both. However, research conducted since then has more clearly defined the limits for artificial atmospheres. The minimum partial pressure of oxygen required to support human physiology is 16 kPa. Some researchers recommend a minimum partial pressure of oxygen of 18 kPa for long-duration space missions (Larson & Pranke 1999); however, 16 kPa is known to be safe, and, as will be shown, permits a ZPB protocol without risk of DCS, which is ultimately better for the crew. The partial pressure of oxygen in airline cabins ranges from 16 kPa to 18 kPa, hence many people are familiar with this oxygen level. 16 kPa O2 is equivalent to an altitude of about 2400 m. Most people can ascend to this altitude without difficulty, although altitude sickness may occur above this level if the person is not acclimatised. More than 140 million people live permanently at an altitude of 2400 m or greater. Astronauts can be conditioned for an O2 pressure of 16 kPa by training in a hypobaric chamber, or at this altitude. A pure O2 atmosphere introduces an unacceptably high risk of fire, such as that which occurred in the Apollo 1 Command Module. The upper limit of oxygen concentration with regard to fire safety is not clearly defined, but 30% is considered reasonable. If the O2 partial pressure is 16 kPa, the minimum total atmospheric pressure must therefore be 53.33 kPa, or slightly more than half the atmospheric pressure at sea level on Earth. NASA specifies a maximum CO2 concentration in spacecraft atmospheres of 0.7% (Toxicology Group 1999). A CO2 concentration of 1% may cause drowsiness, with more serious symptoms occurring at higher concentrations. A typical concentration in normal spacecraft operations is 0.5%, which is a reasonable design goal for the SHAB. The target CO2 partial pressure is therefore approximately 0.27 kPa. NASA specifies a RH (Relative Humidity) of 30-70% for spacecraft atmospheres; i.e. an average of about 50%. At 295-298 K and a pressure of 53.33 kPa, the saturated water vapour pressure is 2.62 kPa. The target average water vapour partial pressure will be 50% of this, or 1.31 kPa. Ignoring trace quantities of other gases present in the SHAB atmosphere, the required buffer gas pressure can be calculated by subtracting the partial pressures of O2, CO2 and H2O from the total pressure. With this buffer gas pressure, an R value of 1.0 is possible if the marssuits can provide an equal pressure. This is indeed possible, as discussed further in the section on Marssuits. One effect of the different gas mix in the SHAB will be a slightly slower speed of sound compared with normal Earthian air. Argon and O2 molecules are heavier than those of N2, which tends to reduce the speed of sound, but the higher heat capacity ratio of Ar partly counteracts this. The net effect is a slight decrease. A lower speed of sound will produce proportionally lower frequencies for fixed wavelengths such as those produced by vocal chords. Hence, the astronauts’ voices will sound slightly deeper than usual, with a frequency reduction of about 4%. A more obvious effect of the reduced air pressure will be a noticeable reduction in loudness. While this will make the SHAB more peaceful with regard to the whirring of fans and pumps, the astronauts’ voices will also sound much quieter and they may need to develop a practice of speaking louder than usual to be heard (a habit they’ll unlearn once back in the THAB). This has safety implications, but since the astronauts will never be more than 9 metres away from each other when in the SHAB, the risk of not being heard is low. Mission doctors must consider the effects on the heart and cardiovascular system of a reduced O2 partial pressure in combination with reduced gravity. Acclimatisation to reduced O2 pressure at altitude is characterised by an increase in pulse and breathing rate as the heart works harder to deliver available oxygen to the cells. Yet, in contrast, the physiological effects of reduced gravity include a decrease in heart rate and arterial pressure, as the heart doesn’t need to work as hard to pump blood against the force of gravity. The low Martian gravity may therefore serve to counteract the effects of low O2 partial pressure in the SHAB. More research is necessary to determine the combined effects and potential health risks. The ECLSS, and perhaps other components of the B330, may require modifications necessary to support the lower air pressure, a buffer gas containing argon, and continuous operation for 1.5 years on Mars. In addition, it should include backups for all subsystems, enabling any to be taken offline for repairs or maintenance as required. Aspects of atmosphere design relevant for the SHAB apply equally to the CAMPER. The goal is to provide a safe and healthy atmosphere and support a ZPB protocol, while keeping the mass of the CAMPER as low as practical. The CAMPER can be made lighter than it would need to be with an internal pressure of one atmosphere. No adaptation or prebreathing will be required when transitioning between the SHAB and the CAMPER. The same ZPB protocol for EVA can be used for both the SHAB and the CAMPER. The same equipment (such as laptops, scientific instruments and sensors) can be used in both environments. With the SHAB and CAMPER having the same atmospheric composition it may also be possible to connect the CAMPER directly to the SHAB; for example, with a person-sized hatch to make it easy to transfer between them without needing to suit up or go through the airlocks; or perhaps simply with a pipe to refresh and replenish the CAMPER’s atmosphere. One of the goals for the SHAB is that it include an ISAP system that will manufacture breathable air for the crew and replace losses. The inclusion of such a system will obviate the need to bring breathing gas from Earth, and relax constraints on air supply. The primary constituents of the Martian atmosphere are CO2, N2, Ar, whereas those of Earth’s are N2, O2 and Ar. Therefore, all the elements required to make breathable, Earth-like air are readily available from Martian air. After landing, the SHAB’s systems will be remotely activated from Earth, initiating the ISAP unit and filling the SHAB’s tanks with O2 and buffer gas. As the SHAB is being sent one launch window earlier than the crew, there will be about 20 months to achieve this, in addition to testing the SHAB’s other systems, before the crew leave Earth. The SHAB will most likely be inflated and fitted out on Earth prior to sending it to Mars, in order to permit installation of all equipment, fixtures and fitting in advance, thus sparing the crew this task. If the SHAB does not arrive at Mars fully inflated, however, the ISAP unit could be used to inflate it to the required operating pressure before the crew arrive. The DRA proposes partial ISAP in which N2 is extracted from the Martian atmosphere for use as a buffer gas. However, it is energetically cheaper to simply use the gas that remains after dust, CO2, H2O and toxins are removed from Martian air, as this is mostly N2 and Ar, and both are perfectly good buffer gases. Argon comprises 1% of air on Earth and is non-toxic and unreactive, and there’s no practical reason to separate it from the N2, which would require additional energy due to the low boiling points of N2 and Ar (assuming fractional distillation). Step 1: Mars atmosphere is drawn into the system through a dust filter. Step 2: Water is removed from the gas mix via adsorption by zeolite 3A (see In Situ Water Production). The captured water is stored in the SHAB’s water tank. Step 3: As in the ISPP system, CO2 (about 96%) is separated from the remainder of the gas mix via condensation. Step 4: The CO2 is electrolysed into O2 and CO using SOECs. Both products are stored. The mixture of gases that remains after CO2 removal is mostly comprised of N2 and Ar, with small amounts of other gases, including O2 and water vapour, plus a few undesirables: O3, CO, and NO. (NO is technically non-toxic, but rapidly oxidises to toxic NO2 when mixed with O2.) Trace amounts of noble gases such as neon, xenon and krypton, which are inert, non-toxic and harmless, may also be present. Step 5: The mixture of gases is first passed through an ozone scrubber (an inexpensive COTS item), which reduces the O3 to O2. Step 6: The remaining gases are then passed through an ordinary automobile 3-way catalytic converter (also an inexpensive COTS item), which converts CO into CO2, and NO into N2. Step 7: The result is a safe buffer gas comprised predominantly of N2 and Ar, with small amounts of O2 and CO2, and traces of inert noble gases. This mixture can be combined with additional O2 to provide breathing gas for the SHAB as per the design atmosphere described above. The small amount of CO2 in the buffer gas will not be an issue, as any excess will be readily scrubbed out by the ECLSS. More research is required to complete a design for this system. It is necessary to determine rates of breathing gas consumption and production (including recycling efficiency); gas separation techniques; the unit’s mass, volume and power requirements; and how it will integrate with the ECLSS. The SHAB atmosphere is about 30% O2, 70% buffer gas by weight. (This is approximately the same proportion as by volume, because a 50-50 mix of N2 and Ar has about the same overall molecular weight as O2.) Therefore, for each 33 kg of buffer gas, only about 14 kg of O2 is required for habitat air, leaving a potentially large surplus. In combination with CO, this may be an effective means of energy storage. O2 and CO may be produced during the day using solar energy, then recombined in a fuel cell during the night to produce power for the ECLSS and other systems. Inflating weather balloons. As O2 is lighter than CO2, balloons filled with O2 will rise in the Martian atmosphere. If H2 is brought from Earth as described in the DRA, it could be combined with O2 in order to make water. Water is one of the most important resources required for a HMM, fundamental to life support in addition to being a source of hydrogen for ascent propellant. Calculating exact water requirements is difficult, as water is present in food, air, and all human wastes, and can be used for purposes as diverse as drinking, food preparation, hygiene, spacesuit cooling, and food and oxygen production. Both the THAB and SHAB include a Water Recovery System (WRS) similar to the WRS in the Tranquility module in the ISS. The WRS on the ISS can recover 93% of the water it receives; however, NASA has expressed an intention to improve the efficiency of water recovery to greater than 95%. The WRSes on the THAB and SHAB are assumed to have an efficiency of about 95%, which is probably realistic given the development time frame. Water will be separated from human metabolic wastes, including perspiration, urine and faeces, via centrifuge and lyophilisation (freeze-drying). Residual solids will be stored in waste containers as powder. This process recovers the water while also making the waste biologically and chemically stable and minimising waste storage mass and volume. Any water used for spacesuit or marssuit cooling will be retained in the suit rather than vented to the environment, and returned to the WRS for recycling. Water is not used as a source of O2; rather, O2 is fully recovered from exhaled CO2 in the THAB, or produced from Martian atmospheric CO2 in the SHAB. The astronauts won’t lose any mass during the mission. In actuality, they probably will, including some water. The MAV uses Martian H2O as a source of hydrogen for methalox ascent propellant. This is discussed separately (see In Situ Propellant Production). The following values (ed. Hanford 2004) are used for calculating approximate water requirements for life support. Values have been converted to kilograms per person per sol (kg/p-sol), to account for the fact that the crew will be living on Martian time during the mission. The THAB will include 1-2 EVA spacesuits for emergency use in the event that external spacecraft inspections or repairs are necessary, or for fun. EVAs during the space element will probably be infrequent and brief, and hence additional potable water consumption for EVA doesn’t need to be considered. However, the crew will be exercising up to about 80 millisols (about 2 hours) per sol to counteract the effects of microgravity, which, for sake of a first-order analysis, can be counted as effectively equivalent to EVA in terms of physical exertion. About 2 kg/p-sol will come from crew drinks, with the balance coming from the water content of food, plus additional water used in meal preparation. It’s worth noting that the values shown for additional water consumption and production as a result of EVA were originally calculated for gas pressurised spacesuits, which require much greater physical exertion than MCP suits. They are therefore likely to be high; however, they will suffice for this exercise. A small amount of water is produced by the body as a byproduct of energy production, and this additional water is released into the spacecraft environment as part of the crew’s metabolic waste. This water is captured by the ECLSS and purified, and therefore represents a small gain that counteracts water consumption. Different values are recommended (ed. Hanford 2004) for hygiene water requirements in different space habitation situations. If the goal was to minimise water usage as much as possible then the preferred values for the space element would be those for a transit vehicle. However, the values shown were developed for an ISS-style habitat, which is much more compact than the B330. In fact, they are so conservative that metabolic water production would almost exactly balance recycling losses, causing the net water loss during the mission to be virtually zero. While that would be good, the THAB would probably not smell too nice after a few months and the astronauts would feel quite grubby. These things would cause adverse psychological effects. The B330 has the capacity to carry a reasonable supply if water, and, in fact, the intention is to line the interior of the THAB with water tiles in order to provide additional radiation protection. While this could potentially be achieved using some other material, having a moderately abundant supply of water provides the important psychological benefit of being able to wash hands and bathe (it’s hard to shower in microgravity, but at least the astronauts can bathe with a wet cloth). In addition, this provides a safety margin that can be accessed simply by skipping hand washing and bathing. Therefore, for these calculations the values for an early planetary base are used for both the surface and space elements of the mission. As discussed in the next section (Surface Element), water may be required for cooling spacesuits and marssuits, depending on their design. However, as mentioned, EVAs probably won’t be a major feature of the space element. Spacesuits would only be required infrequently and briefly, and therefore consume minimal water for cooling. Research, such as growing plants in space. This amount is difficult to estimate without a clear definition of the experiments. Medical incidents. Requirements will depend on the incident, but an average value per incident may be on the order of 1-5 kg. The frequency of incidents is difficult to estimate, although during the space element they should be very low. A nominal water budget of 0.25 kg/sol is initially allocated for these uses, to be modified later as details of the mission evolve. The DRA includes contingency water in Adeona’s supplies in case all or part of the surface mission is aborted and the crew need to remain in, or return to, the orbiting MTV until the TEI window opens. This contingency quantity is equal to approximately 1.5 years’ supply, i.e. the full duration of the surface mission. However, the rate of water consumption will not be identical to that required for the surface mission because of the lower requirements for spacesuit cooling and and other miscellaneous uses such as medical and ISFP. Surplus contingency food and water, in addition to waste, will be jettisoned before TEI in order to reduce mass. Adeona’s equipment, including the WRS, will naturally be designed for the lowest possible failure rate. However, a failure rate of zero is impossible to guarantee, particularly during a space mission. Equipment failure rates typically increase over time, and this equipment will have a minimum lifetime of 2.5 years; potentially much longer if reused for multiple missions. If the WRS fails, grey water can be stored until repairs are performed, after which the system can be operated with a higher-than-usual rate to recycle that water. However, it may still be prudent to have a contingency buffer just in case. At this early stage it’s difficult to determine exactly how large such a contingency buffer needs to be, but 1 week’s supply will serve as an estimate for now. This would cover a situation in which the water recycling unit was offline for up to 1 week. The total duration of the mission is about 885 sols. Because of the possibility that the crew may need to spend this entire period living in Adeona, the total water requirement depends on this duration rather than simply the total duration of the space element (350 sols). The estimate may be somewhat low, especially if water is required as a source of O2. However, it will suffice for now. The amount of time spent on EVA pertains directly to water requirements, as potable water consumption, metabolic water production, and requirements for marssuit cooling water all increase linearly with EVA time. For 6 sols per Martian week there are two EVA shifts, nominally of 160 msol each (~4 h). The maximum total EVA duration per person per sol will therefore be 320 msol. The maximum number of crew members on EVA at any one time will be four. For safety, there must always be at least two crew members in the SHAB, communicating with crew members on EVA and with MCC, writing and recording reports, cleaning and maintaining the SHAB, and so on. One sol per week (Martian equivalent of Sunday) the whole crew remains together in the SHAB for “family day” group activities (e.g. Sunday lunch, movie), rest and relaxation, and personal free time. The same base values as for the space element are used for calculating water requirements for the surface element. However, a larger amount of time will be spent on EVA. The rate of hygiene water usage will be the same in the SHAB as in the THAB, as the values for an early planetary base are used. Therefore, the requirement will be 47.22 kg/sol. As yet, it is unknown which of these the IMRS marssuits will employ, or if some new or alternative method will be used. For the purpose of these calculations a radiator is assumed for marssuit cooling, and thus an estimated water requirement of 0.19 kg/h of EVA while on Mars. As for the space element, additional water is required for research and for medical incidents. In both cases, more water will be required during the surface element. Experiments will be conducted in ISFP (e.g. growing vegetables), which will require water, regardless of the growing method. Areological and astrobiological laboratory research may also require water. Medical incidents will be more frequent considering the large amount of time spent working outside. Therefore, an additional water budget of 1 kg/sol is allocated for these requirements. Again, this value may be adjusted as details about surface activities become available. The DRA proposes transporting hydrogen to Mars for the purposes of making water for life support. O2 obtained from atmospheric CO2 would be combined with the H2 to produce H2O and energy. However, there are a variety of nontrivial problems associated with transporting and storing H2, which are discussed in greater detail in Propulsion. In addition, storing H2 in the SHAB could incur a risk of explosion. The plan for Blue Dragon is to obtain all the water needed for the surface mission from the local Martian environment. Although this is technically challenging, it is achievable and worthwhile. Transporting hydrogen across 100 Gm of interplanetary space to a world where it’s already present in abundance would be highly inefficient, both in terms of the cost of transportation, and the investment in engineering solutions with zero long-term value. The capability to extract water from the Martian environment is a fundamental requirement for long-term habitation of Mars, and therefore must be developed eventually anyway. Water on Mars is almost entirely present in the form of ice, with approximately 5 million cubic kilometres having been identified at or near the surface. A small amount of water vapour is also present in the atmosphere. Various hydrated minerals and clays have also been identified, and, although the quantity of water in this form is currently unknown, it may be significant. Ideally, one or more precursor missions will be implemented to test and develop ISWP equipment before running human missions (see Precursor Missions). The concentration of water vapour in the Martian atmosphere is very low, however, it has the advantage of being much more accessible. At the University of Washington in 1998, researchers designed a device called a WAVAR (WAter Vapour Adsorption Reactor), which extracts water from the Martian atmosphere via adsorption into zeolite 3A (Grover et al. 1998; Adan-Plaza et al. 1998). The 885 kg WAVAR unit was designed to produce 3.3 kg of water per sol, a quantity determined to be sufficient for crew water requirements during the surface element of the NASA DRA. As calculated above, the minimum water requirements for Blue Dragon may be less then this amount. A unit similar to the WAVAR may therefore be ideal for an IMRS mission. Assuming that this rate of water production is achievable, a WAVAR unit of this size attached to the SHAB could produce 1927 kg of water before the crew leave Earth. This is greater than the minimum required for the mission, which would give a high confidence in water security (again highlighting the benefit of predeploying the SHAB). The WAVAR would continue to produce another 578 kg during the crew’s outbound trip of 175 sols, and another 1766 kg of water during the surface mission, for a total of 4271 kg of water. This is more than three times the calculated minimum requirement, and would go a long way towards total water security. If the WRS suffers a serious failure, this quantity of water could last up to 17 weeks. Therefore the WAVAR unit (as described in 1998) will be adequate for providing water for the surface element, and presumably an even better unit can be designed and built using 21st century engineering. The gap between departure of Alfa Crew and the arrival of Bravo Crew is only about 8 months, allowing less time to fill the tanks, but there will still be plenty. For the SHAB, sufficient water for the first few human missions can be obtained from the atmosphere. However, far more can be obtained from the ground, and in order to support food production, longer missions and larger crews, and to provide optimal water security, this capability should be developed as early as possible. For the MAV, the quantity of water necessary for propellant production is too large to rely on atmospheric sources. Blue Dragon therefore introduces a system called AWESOM, which is a mobile robot that traverses the nearby terrain, extracting water from the top layer of regolith, and delivering it to the MAV. Research has shown that a substantial fraction of the ice in the top layer of regolith may be liberated using microwave radiation (Ethridge & Kaukler 2012). The frequency of the microwaves can be tuned to preferentially heat water molecules rather than dirt. As discussed in Site Selection, the ground at the proposed location for the IMRS should be at least 7% water by mass, and ideally about 10%. It should also be reasonably flat and free of rocks to support mobility of the AWESOM robot. The robot will traverse the ground around the MAV collecting water, and returning to the MAV to unload at the end of the sol, or whenever its tank is full. The Curiosity rover is powered by a plutonium-fuelled RTG (Radioisotope Thermoelectric Generator) known as the MMRTG (Multi-Mission RTG), which produces about 110 W of electricity from about 2000 W of heat. While an RTG would be effective for the AWESOM, an ASRG is likely to be preferable. These are more than four times as efficient as RTGs, each one capable of producing 130 W of electricity from 500 W of heat generated from 1.2 kg of PuO2 (plutonium dioxide). With the same quantity of PuO2 as Curiosity (4.8 kg), which would require four ASRGs, the AWESOM could produce 520 W of electrical energy from 2000 W of heat. Further analysis is required to determine exactly how many ASRGs will be sufficient for water mining. The ASRG will function as a source of both heat and electrical energy, with the electrical energy being partially utilised to generate microwave radiation. The heat and microwaves will both be directed at the ice, causing it to sublime, and releasing H2O from the regolith without the need for digging. As described by Dr Robert Zubrin (Larson & Pranke 1999), the robot will have a flexible skirt brushing the dirt to contain the released water vapour beneath the robot. The moist air will then be sucked up through a dust filter using a fan, and the water extracted from the Martian air via adsorption into zeolite 3A in the same manner as in the WAVAR. Keeping water in a liquid phase within the AWESOM’s tank will require heat and pressure, because of the low temperatures and pressures at the Martian surface. The tank will therefore be pressurised, with heat provided by the ASRG. Heat from the ASRG can also keep the robot’s electronics sufficiently warm. The hose for transferring water from the AWESOM robot to the MAV’s tank will also need to be heated, although this will be done electrically. The AWESOM will return to the MAV to unload at the end of each sol, sparing it the energy cost of keeping the water in liquid phase overnight. The AWESOM robot will have a simple robotic arm for connecting the end of the hose into a socket at the base of the MAV. It will also include a pump to transfer the water. Since electricity for microwaves and motors will not be required while the water is being transferred, it will be wholly available to power the robotic arm, pump, and heating of the hose during this process. The robot will use radio communications with the MAV to keep track of what ground it has already covered, infra-red proximity obstacle detection sensors like those found on cars and vacuum robots, and a neutron moisture meter to measure the water concentration in the regolith. AWESOM will also feature cameras to send images back to Earth, which will assist with remote operation and debugging of the robot, should that be necessary. The robot will be designed to operate fully autonomously. Enough water can be collected more easily from the atmosphere. The AWESOM robot from the MAV can be moved to the SHAB when the crew arrive. Bring no H2 or H2O from Earth. This significantly reduces the landed mass of the SHAB, and avoids the problems inherent in transportation and long-term storage of hydrogen. On arrival at the IMRS, two crew members drive the CAMPER to the MAV, collect the AWESOM robot and bring it back to the SHAB. At this point the ISPP process will be complete, the MAV’s propellant tanks will be full, and it will no longer need the AWESOM (assuming zero propellant boil-off or leakage during the surface mission). The SHAB will have a similar external water intake valve as the MAV, and the AWESOM robot can be programmed for collecting water from around the SHAB. This will provide abundant additional water for the crew, and function as a backup to the WAVAR, while affording the engineers an opportunity to study the robot’s performance and improve its design. Assuming a rate of water production of around 29 kg/sol (see In Situ Propellant Production), the AWESOM robot could produce up to an additional 15 tonnes of water during the surface element. If the AWESOM cannot be retrieved from the MAV, or fails for some reason, the water collected by the WAVAR will be sufficient. When Alfa Crew depart, there should be enough water left over in the tanks to support Bravo Mission. However, both the WAVAR and the AWESOM are able to operate autonomously and will continue to collect water for the SHAB during the 8 months before Bravo Crew arrive. If both are fully operational during this period, perhaps 5-10 tonnes of additional water can be collected during this time. If one or both fail, it won’t matter as long as there’s at least 1.2 tonnes in the tanks to support the minimum requirements of the mission. Bravo Crew may be able to repair the ISWP equipment when they arrive. When Bravo Crew arrive they can collect the second AWESOM robot from the second MAV, and bring it to the SHAB where it can replace the first AWESOM. If the first AWESOM is still operational, both can be used together, one at each SHAB. Otherwise, it can be repurposed, or used as a source of spare parts. Its ASRG could be used to augment SHAB or CAMPER power. As more ISWP assets are accumulated at the base, water will be available to astronauts in increasing abundance, and as the water is put to use for food production, the base will gradually become self-sufficient. The DRA details food requirements for a crew of six on a long-stay human mission to Mars. If IMRS uses the same food system as the DRA then the food requirements will be basically the same, because the crew size and approximate durations of both the space and surface element are the same. However, with new innovations in food technology it may be possible to substantially decrease the mass, volume, energy and time requirements of the food system, in addition to significantly reducing waste. New powdered food products such as Soylent (Rhinehart 2013) are emerging, which claim to be nutritionally complete and may potentially carry a wide range of advantages, most of which are applicable to space missions. They require minimal time to prepare, as they only need to be mixed with water and a small amount of oil, require minimal cleanup, produce no waste (at least in the form of inedible biomass), have an extended shelf life, require minimal packaging and do not require refrigeration or cooking. There is also anecdotal evidence that subsisting primarily on such foods is beneficial for health and improves mental clarity, due to the low toxicity and absence of unnecessary calories and ingredients. By ensuring that all the body’s nutritional needs are met in an optimised way, this type of food may be healthier than a typical human diet (not that this implies it’s the healthiest possible human diet). Powdered food seems extremely well-suited to long-duration space missions, and is even sometimes called “space food”. It’s lightweight and compact, can cater for the crew’s nutritional requirements in an efficient way, and could potentially optimise their physical and mental functioning. The elimination of refrigeration and cooking equipment greatly reduces associated mass, volume and energy requirements. The first human missions to Mars will need to be optimised for mass and energy as much as possible in order to make them affordable and achievable. Every kilogram and kilojoule saved in terms of food, packaging, waste, and food storage and preparation equipment means a lighter and cheaper mission, reducing cost and increasing viability. In addition, the ease with which meals can be prepared saves considerable time. The astronauts may be so busy, especially once on Mars, that they may appreciate not having to devote so much time to food. To mix and consume a shake a couple of times per sol could save an hour or more in time spent preparing and consuming food, and cleaning up afterwards. It’s important to remember that this is an historic exploration mission, not a holiday. In this regard, analog studies do not reflect reality. Although life at the MARSes are undoubtedly busy, the stress level is low, the feeling is generally relaxed, and there is ample free time. Astronauts on Mars, however, will have a tremendous amount of work to do while conforming with strict rationing and safety regulations. Naturally there will be time for rest and recreation so the crew remain happy and healthy for the duration of the mission, but planners will be under pressure to achieve the greatest possible ROI, which means the crew will be given plenty to do, especially while on Mars. They may appreciate meals that are very quick to prepare and consume, as well as nutritious. Evidence of a substantial market for convenient and healthy food of this type has become apparent, suggesting that investment in this type of food technology will increase. The likely result will be numerous innovations, including improved formulas and flavours emerging during the next 1-2 decades; which is to say, before the first HMMs. A formula suitable for astronauts spending time in reduced gravity environments could be developed, perhaps higher in certain key nutrients such as calcium and protein, or even including bisphosphonates (a drug that prevents bone loss). The flavour of Soylent is neutral. A wide variety of powdered flavour additives are available to be mixed in, including chocolate, vanilla, caramel, coffee, various fruits, peanut butter, chilli, cheese, bacon and many others. A range can be included with the astronauts’ food supply, allowing them to be creative and mix their own favourite combinations, and to vary these as desired without compromising their nutrition or investing significant time. Waste can be significantly reduced by using powdered food. For example, rather than using meal-sized plastic containers, powdered food can be stored in large drums, which can be repurposed when empty. This is in stark contrast to conventional space food, which generates approximately 300-500 grams of waste per person per day. For a 910-day mission with a crew of 6, this is over 2 tonnes of waste. Wasted food and water is also likely to be much less. With conventional space food, food packaging waste includes adhered food and food preparation water, which is typically not recovered. However, with powdered food, portion size is easy to control, a single serve is likely to be fully consumed, and the water content of adhered food can be recovered by rinsing the shaker and emptying the liquid into the WRS. The optimised nutritional profile of powdered food means highly efficient utility by the body, and thus reduced mass and volume of solid waste. This correspondingly reduces the energy required to process the waste, the volume required to store it, and the amount of water lost in the recycling process. In addition, because the whole crew would be eating basically the same food for the entire mission, the chemical profile of waste products would be highly predictable, which may suggest opportunities for more efficient or useful methods of processing or recycling waste. Studying the metabolic waste products produced by powdered food will generate ideas for progressively improving the formula and making it yet more efficient, and producing even less waste. Research at the ISS and MARSes has shown that the experience of spending time with other crew members in familiar domestic situations such as preparing meals and eating together provides important psychological benefits and is effective for building relationships and morale. Food is something we all have in common, and meal times stimulate team communication, camaraderie, humour and fun. It’s therefore a legitimate argument that providing the crew only with powdered food for 2.5 years could largely deprive them of these experiences, potentially exacerbating feelings of boredom or frustration, or even contributing to mental health issues. The food that astronauts currently eat is pretty good, but it’s all pre-prepared. It’s add-water-and-heat, and you have your meal. But even those meals, even when they try to make variations, after a couple of months people get tired of that, and so they start to eat less. As a consequence they might also perform less, and jeopardize the mission. For example, in the Mars-500 experiment — an isolation study of 500 days near Moscow, a collaboration between Europe and Russia — food became the item that people constantly talked about. Food is absolutely crucial to the psychology of your crew, and you need to handle that carefully. One of the solutions could be to allow the crew to cook. Because cooking empowers you over your food. You can make endless variations, and there’s an interesting bonus: it improves social cohesion. You talk about food, you share food. It’s a basic human thing. The reason that space agencies have been holding it off are twofold. First of all, current human space exploration is done in microgravity conditions — like in the ISS — and as such cooking has hardly been possible. One needs a good deal of gravity to cook meals. In HI-SEAS we’re talking about simulating life on the surface of Mars, not about traveling to Mars. And since there’s a decent amount of gravity on Mars (38% of Earth’s gravity), you can do your regular cooking. Cooking in microgravity in the THAB may be difficult, but in the SHAB experimentation with cooking would represent valuable research in addition to fulfilling an important social function. If a group of astronaut candidates was asked if they would still want to go to Mars if it meant living only on powdered food for 2.5 years, there’s little doubt they would accept that condition. The sociopsychological benefits of shared meals could be generated in some other way, such as morning meetings over tea/coffee, or group social activities such as movies and games. However, the psychological state of the crew is one of the biggest risks to the mission, and research shows that food is an important part of that. It may be that a compromise is therefore optimal, with powdered food being consumed one or two meals per sol, but with a social crew meal at other times, plus snacks of favourite conventional food. This balance would still generate an appreciable reduction in mass, volume, energy, time and waste, while allowing opportunities for the astronauts to be creative and prepare meals for each other, and to have an enjoyable social experience. Therefore, the IMRS missions are currently envisaged as providing 50% “normal” food and 50% powdered food. This will produce some of the benefits of using powdered food, without the crew going crazy from food boredom or lack of social interaction. The conventional food utilised during the space element will be the traditional “add water and heat” pre-prepared meals, as these are designed for the microgravity environment. However, for the surface element, normal food will be provided in the form of ingredients that can be combined and cooked in the SHAB, thus providing a pleasurable, social, interactive experience once per day, at the evening meal. Breakfast and lunch can be powdered food, which is quick and easy, and will give the crew the necessary energy and nutrition to do their work. Snacks during the day could also be normal food, such as dried fruits, chocolate, nuts, etc. Naturally the crew will also have access to abundant supplies of the finest organic coffee, tea and cocoa that Earth can produce. For the purpose of this exercise, only the dry mass of food is considered, not the mass of packaging or food preparation equipment. The standard food requirement is 0.634 kg/p-sol (ed. Hanford 2004). As with water consumption, EVA increases food requirements by an additional amount, which is 0.029 kg/p-h (0.715 kg/p-sol). The same estimates for time spent on EVA as used in calculating water requirements must also be used: an average of 80 msol/sol during the space element, and an average of 183 msol/sol during the surface element. 0.166 kg * 1.0275 * 3 = 0.512 kg/sol. Adjustments to caloric and nutrient requirements may be necessary to support the physical stresses of the mission, which could affect the mass of daily requirements. However, this figure will serve for a first-order analysis. Assuming the same ratio applies between IVA food requirement and EVA additional food requirement as for conventional food (about 113%), the additional powdered food required for EVA will be approximately 0.577 kg/sol. The food that is carried aboard the transit habitat includes transit consumables that are needed for the round-trip journey plus contingency consumables that are required to maintain the crew should all or part of the surface mission be aborted and the crew forced to return to the orbiting MTV, which would then function as an orbital “safe haven” until the TEI window opens. Any remaining contingency food remaining on board the crewed MTV would be jettisoned prior to the TEI burn to return home. Explorers and settlers of Mars will certainly want to grow their own food, for food security, convenience, independence, variety, and long-term sustainability of settlements. Even from the very first mission, it’s likely that astronauts will experiment with food production. Crews in at least the first few human missions to Mars will not be able to rely on locally produced food, as food is mission critical, and considerable research will be necessary to learn how to grow it on Mars. In addition, food production requires volume, energy, equipment, nutrients and water, which won’t all be available during those early missions. Therefore, all the food required for the space and surface elements of the mission will be transported from Earth, and this will continue to be the case until the necessary agricultural technologies and processes have been developed for Mars, and the necessary resources are available, to reliably produce sufficient food. Even once food production is underway on Mars, it may still be years before a nutritionally complete variety of crops is being locally grown. Growing plants requires equipment, such as pipes, pots, hoses, trays, racks, lights, filters, tools and more. Growing plants requires volume. Whether growing the plants in Martian dirt, or using a hydroponic or aeroponic system, a significant volume will be required to produce food, even for a crew of six. Providing this volume would necessitate a larger SHAB, or a dedicated greenhouse. In addition, production of nutritionally-complete food for the crew would require growing a wide range of different plants, and it may be difficult to to grow a large number of different crops in a restricted volume. Growing plants requires environment control. If the greenhouse is separate from the SHAB it will require its own ECLSS, as sufficient heat will be required to prevent plants from freezing, and CO2 and humidity levels must be controlled to optimise growth rates. This ECLSS will require additional energy. Even if crops are grown in the SHAB, or in a greenhouse connected to the SHAB, thus leveraging its ECLSS, a larger unit with higher energy requirements will be needed. The lower gravity reduces the rate of exchange of gases such as O2 and CO2, which causes plants to grow slower and evaporate less water. Greenhouses may require a higher atmospheric pressure or elevated CO2 levels or temperature to compensate. Growing and eating plants produces waste in the form of inedible biomass. This could be composted with the crew’s solid waste into fertiliser. However, compost is only really useful if the plants are grown in soil, and aeroponic systems may be preferred during the early stages of exploration and settlement of Mars. Simply dumping biomass on the surface of Mars may violate planetary protection protocols. Biomass may need to be incinerated. Growing plants requires light. Solar intensity on Mars is only about half that of Earth, which is sufficient for photosynthesis, but may also contribute to slow growth rates. Sunlight within greenhouses may be supplemented with additional lighting. 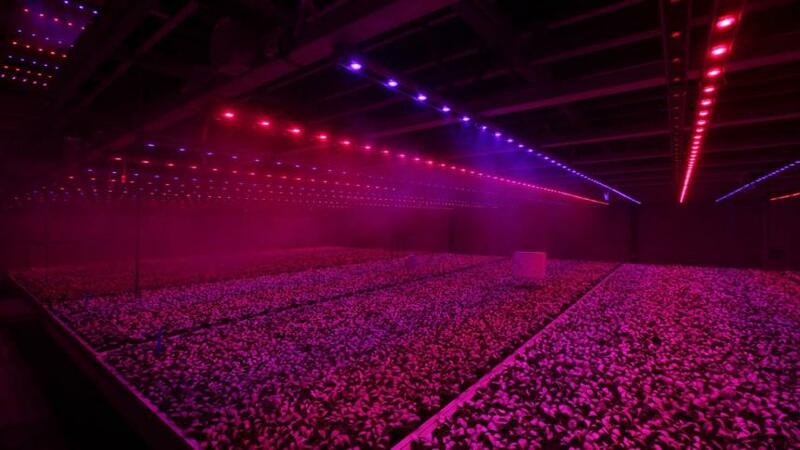 To control energy requirements, LEDs (Light-Emitting Diode) that produces photons of the specific frequencies used by plants (blue, red and a little infra-red) may be utilised. Plants can even be grown indoors using only this type of lighting. Clearly Martian agricultural processes will be very different from those on Earth. In spite of these challenges, ISFP is a fundamental enabling capability that needs to be developed for human settlement of Mars. Human missions should therefore incorporate experimentation into food production while at Mars. The DRA also considers ISFP to be a key objective for human habitability of Mars. One advantage unique to Mars is that, because the sol is only marginally longer than a day, it should be easy for Earthian plant species to adapt to Mars’s diurnal cycle. On Earth, the name for growing crops in dirt is “geoponics”; hence, on Mars the technically-correct term is “areoponics”, although perhaps this term will not enjoy common usage due to potential obvious confusion with “aeroponics”. Martian soil contains all the nutrients necessary to support plant growth, and could be made yet more amenable to plants via the addition of organic matter and micro-organisms such as nitrogen-fixing bacteria and mycorrhizal fungi. One of the advantages of using dirt to grow plants is that it’s available in abundance and easily obtained. Another advantage is that metabolic waste from the crew, and food and vegetable scraps, can be composted and mixed with Martian dirt to produce fertile soil. More area is needed compared with other methods. Water requirements are comparatively high. Separate greenhouses are necessary because dirt isn’t wanted in the SHAB (see Airlocks). Hydroponics may be preferable option, which is how Mars One are proposing to grow food in their habitats (see below). Hydroponics obviously requires water, however, this can be recycled through the system with high efficiency. One question is whether the plant nutrients would be brought from Earth, somehow extracted from the Martian dirt, or both. Aeroponics, in which plants are suspended in air and nutrients are delivered to their roots via a nutrient-filled mist, may be a promising option for the IMRS due to the low water requirements. Lettuce, strawberries and many other types of plants can be grown aeroponically. However, separate greenhouses are required for areoponics also, as mist in the SHAB could affect electronics and crew health, and produce mould. An advantage of aeroponics is that the plants have full access to the O2 and CO2 in the air. The O2 acts as a purifier and helps to keep plants healthy, and CO2 levels in the greenhouse atmosphere can be optimised to maximum plant growth rates. Aquaponics is a combination of aquaculture and hydroponics, in which fish tanks are connected to a hydroponics setup in a mutually beneficial symbiotic relationship. Water containing fish waste, which is high in plant nutrients, is channeled from fish tanks through the hydroponic system to feed the plants. Conversely, plant cuttings and food scraps are used to feed the fish. Aquaponics may become extremely popular on Mars, as fish will provide an abundant and welcome source of protein and essential fatty acids. If suitable tanks can be incorporated into a greenhouse design, it may be possible to transport fingerlings to Mars, for example salmon, barramundi or tilapia, and grow them at the IMRS. Stingless bees could be utilised in greenhouses for plant propagation, and would also produce honey. Worms may be introduced for processing mineral grains, fertilising soil, and feeding fish. They can also be eaten by humans and are a good source of protein. Insects such as crickets are another potential protein source. Chickens are low-maintenance, would be a source of meat as well as eggs, are highly effective at processing food scraps into fertiliser, and make great pets. The Mars One mission requires the astronauts to grow their own food on Mars. If successful, their efforts will certainly be instructive in future ISFP attempts. Their intention is to grow plants inside the habitat modules using a hydroponics system similar to PlantLab. PlantLab is a highly efficient indoor crop production system developed in the Netherlands, with low volume, mass and energy requirements. 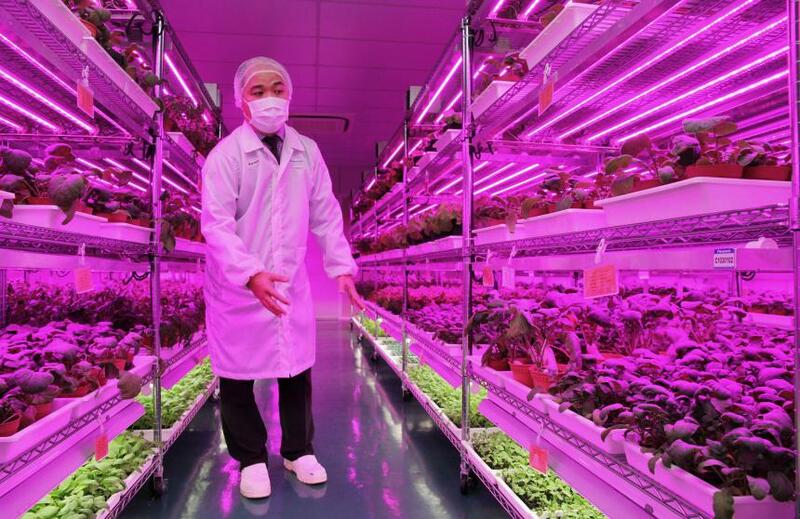 Following research conducted by NASA, plants will be grown under LED lighting that only produces frequencies used by plants, thus optimising energy requirements. Natural sunlight will not be used at all. Crops will be arranged in vertical racks to reduce space requirements, and the intention is to produce enough food for 12 astronauts with just 50 m2 of growing area.